Here is your opportunity to become the "Lord of the Rings" (sorry, I just couldn't help myself!). Training rings allow you to develop accurate, penetrating thrusts as well as circular techniques used in manipulation of an opponent's weapon. They are useful for training both staff and spear. Training rings can be made from a variety of materials. They can be made from plywood, then covered in duct tape and hung up with lengths of cord. I used a beat-up old extension cord instead of throwing it away; it is still strong after 20 plus years and will probably never wear out. You could also use lengths of old garden hose, duct taped into a circle, to quickly and easily make durable hoops of varying sizes. Training rings can also have a small wooden disk, suspended in the center. Start your practice with the rings stationary at first. Stand in front of them and thrust your staff or spear through the center without touching the sides. Try to penetrate deeply through the center. Once you can do this well, begin to slowly spin the rings. Your strikes must now be well timed and fast, especially on the withdrawal, to ensure that you do not touch the ring with your weapon. Add footwork to your practice and perhaps even swing the rings as they spin. You can also practice circles inside the rings coming close to but not touching the sides. This is good practice for circular techniques such as cutting under an opponent's weapon to take the centerline, or for hooking disarms. This might fall under the heading "unarmed defense against a spear," as you would not be likely to employ this strategy if you already had a spear in your hands, opting instead for the safer motion of parrying the opponent's throw. I could imagine a scenario, however, where you might be unarmed or have a shorter, inferior weapon, with the opponent attempting to engage you, but you keep evading and staying out of range. The frustrated opponent throws his weapon at you, at which point you unexpectedly catch the spear and turn the tables on your startled opponent. While this seems far-fetched at first, with some practice it is quite possible. Like new feats of athletics, some things seem impossible until one person does it, and soon, it seems like many others can accomplish the same feat. Part of the trick is the realization that such a technique CAN be done. Through learning how to throw the spear, you will also learn to expect it and see the signs should the strategy be used against you. If you do successfully see the telegraphing movements that lead into a throw, you may be able to counter by catching the spear. First, follow the Three-Step Rule by giving your opponent a target he cannot resist, standing square, but well out of reach. 1. As the opponent throws, wait until he is committed to the attack. Once the weapon leaves his hand he has reached the point in his throw where he can no longer change the trajectory of his attack, and you may start your movement. Stay calm and keep your eyes on the opponent's release and the path of the incoming weapon. As the spear leaves his hand, "open the door" by swinging one foot back into line with your lead foot, turning your body back and off the line of attack as you quickly calculate the trajectory of the incoming weapon. 2. With practice and good timing you can grab the shaft as the weapon goes by. 3. With a quick twirl to redirect and bring the momentum of the weapon under control. 4. you can quickly spin the spear into position to guard, attack, or throw. a compendium of practical crafts and fun games published for boys and girls by The Farm Journal in 1919. "Secure two barrels, about flour-barrel size, and two poles. Each pole should be from eight to ten feet long, of the lightest possible wood, with a big soft pad on the end. These are spears for attacking. The barrels are set level, exactly at poles' length apart, center to center. 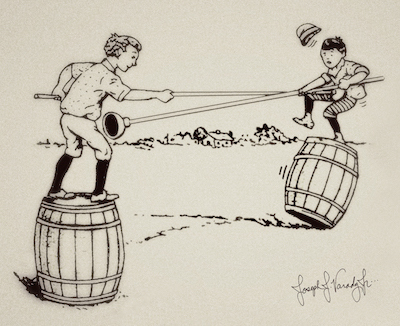 Each contestant takes his place on a barrel, and he must try to put the other fellow off. The umpire stands alongside, near the middle. For safety's sake it is a good idea to have someone stand behind each player to act as a catcher in case of accident. It is counted a foul to push the other player below the knees, to use the spear as a club, to push the barrel, or to take hold of your opponent's spear with your hand. A foul gives the round to the other boy. A round is up when one boy goes off his barrel. If one drops his spear and can recover it without getting or falling off, it is all right. A battle usually lasts for about seven or eight rounds. The best players gain their points by wriggling their bodies and keeping in continual motion. There is a lot of fun and excitement in keeping your balance." Safe "boffer spears" should have light shafts and nice thick striking tips made up of several disks of dense foam glued one on top of the other covered with smooth tape. with sufficiently padded striking tips. Instead of big barrels you could use tree stumps, logs planted in the ground, or upside-down five gallon buckets. Be creative! I like to practice on "kung fu stumps." Sometimes we move and use all the stumps, while other times players have to stand on just one. Sometimes we can only thrust, while at other times, anything goes. Just agree on the rules beforehand to avoid any unnecessary misunderstandings! We also fight on a raised balance beam, really just a long board nailed across two stumps, that we call the "fighting board." Both training tools will improve your balance and enhance your development of strategy and tactics. Whatever equipment you choose to use, be smart and keep the safety of all participants foremost in your mind. Each game has its own particular rules, which can always be changed as need, opportunity, or whim arises. The point is to become more versatile with your weapon, more knowledgeable of strategy, more flexible in your training, and above all, to have fun!